India’s largest crowdfunding site. Over Rs.548.1 Crores raised. Sanjeev lives the impossible everyday. He plays a game that is known for its agility and quickness, effortlessly on a wheelchair! And to add to it, he has consistently won medals and ranks 7th on the list of the top 10 para shuttlers in the world by the Badminton World Federation! Sanjeev, who is confined to the wheelchair since childhood due to polio in his right leg, The skill and speed with which he plays badminton on a wheelchair is a sight you will only have to see to believe, but Sanjeev’s hard work and effort is evident in his achievements. Sanjeev has won 18 Gold medals, 3 Silver medals and 2 Bronze medals in various National Championships so far. 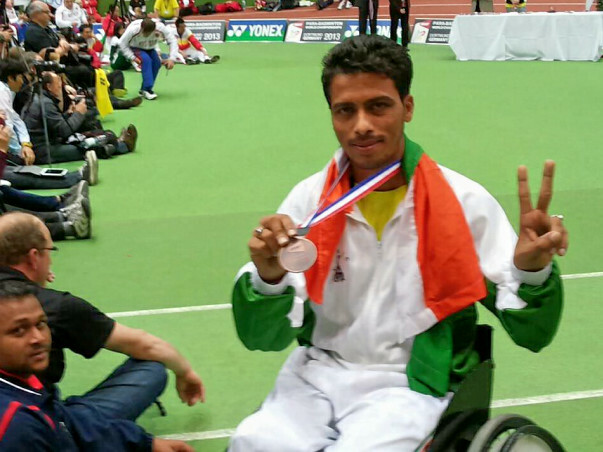 He reached the quarter final of the Asia cup with hardly one year of practice and won the World Paralympic Games. Ever since he took to badminton, he has been pooling in funds himself to train. In fact, during his initial games he had to borrow his wheelchair from another player to compete. He won the World Paralympic games all by himself without any coaching. And, he lost the Asian Para-Games in China in 2010 by a small margin because of not having a proper wheelchair. But, when the Para-badminton Championship in Uganda came close, Sanjeev knew this was an opportunity he couldn’t miss. He asked his friends and family for little amounts of money to fund his trip. As a result, Sanjeev was able to fund his trip - where he proved that he was worth his mettle by becoming the First Indian para-badminton player to win Gold at the Para-badminton Championship! Sanjeev's sole aim is to win at Tokyo. His wheelchair is his greatest setback to winning. “My wheelchair is 7 years old.. I have to be very careful on it. Sometimes I fear the wheels might come off,” Sanjeev says. To play badminton that requires swift movements, Sanjeev definitely needs a better quality wheelchair which is also much lighter than the one he is using now. “Internationally, his competitors use an 8 kg wheelchair whereas he has a 24 kg wheelchair.” Apart from that he has to compete in at least two international tournaments to better his ranking for Tokyo!